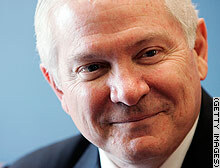 WASHINGTON (CNN) -- U.S. Defense Secretary Robert Gates said Friday that the United States is "not planning for a war with Iran." Gates said he was reiterating what President Bush and Secretary of State Condoleezza Rice have said earlier. The defense chief spoke at a press conference with Gen Peter Pace, chairman of Joint Chiefs of Staff. But Gates said U.S. forces are "trying to counter" what Iranians are doing to U.S. forces in Iraq. He said that "explosively formed projectiles" with roots in Iran were killing troops. Calling the explosives by the acronym EFP, Gates said either the weaponry or the technology for it emanates from Iran. The weapon is more powerful than the roadside bombs that insurgents have used with deadly effectiveness to ambush American convoys in Iraq. The EFP's increased sophistication allows it to penetrate armored vehicles, posing a greater threat to U.S. troops. Gates said the U.S. military strategy is involved in "uprooting" the networks providing the EFP material as well as other explosives used to create the roadside bombs. Referring to the latter explosives, Gates said, "these darn things account for about 70 percent of our casualties." Pace said the military is "working day and night to disassemble" the networks bringing in explosives and the material to make them and is doing that "without regard to nationality" but to "who our enemies are." "It is instructive that at least twice in the last month that in going after the networks we have picked up Iranians," Pace said. When asked whether the government or rogue elements are shipping the material, Gates said, "I don't know that we know the answer to that question." Military investigators reportedly have been looking into the possibility Iranians or Iranian-trained operatives carried out a January 20 attack on a Karbal military compound in southern Iraq that resulted in the deaths of five U.S. soldiers. Gates said the investigation is ongoing and information about who was involved is "ambiguous." Defense Secretary Robert Gates said the United States is "trying to counter" Iranian influence in Iraq but does not plan a war against Iran.